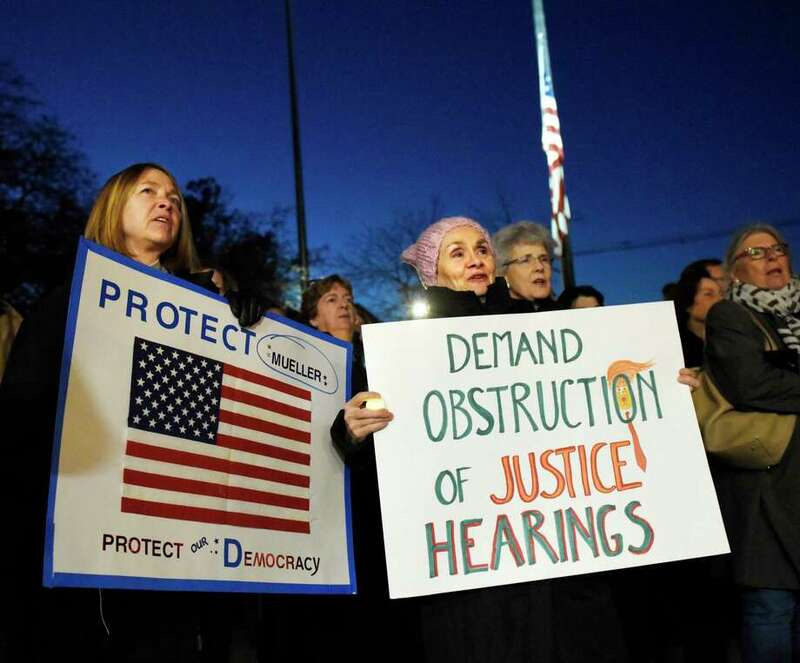 GREENWICH — Calling the “rule of law” at stake, nearly 300 people gathered at Greenwich Town Hall Thursday evening to demand that Congress protect special counsel Robert Mueller’s investigation into President Donald Trump. “When the president controls or takes steps to end a lawful investigation, particularly when that investigation is into his own behavior, that is a direct threat to our democracy,” said Joanna Swomley, co-founder of Indivisible Greenwich. “We need our Congress, which is the only body with the constitutional power and obligation to reign the president in, to do so. Our presence here tonight and the presence of our fellow Americans across the country sends a message to our representatives that we want them to act now,” she said. The protest in Greenwich — one of hundreds held across the country — was put into action after Trump asked for and received the resignation of Attorney General Jeff Sessions on Wednesday, the day after the midterm elections. Trump had repeatedly criticized Sessions for recusing himself from overseeing Mueller’s investigation into Trump and Russian interference in the 2016 presidential election. Nine hundred groups took part in protests nationally, including 14 in Connecticut, led by Indivisible, Move On and other activist groups, said Swomley. This was not the first protest in town for Indivisible, which was formed in 2016 after Trump’s victory. The group has demonstrated at Town Hall against the Trump administration’s immigration policy, and held a “teach-in” on Greenwich Avenue last year to protest efforts to overturn the Affordable Care Act. The group became a major player in municipal elections last year, driving unprecedented performances by Democrats in local offices. That trend continued Tuesday when Greenwich elected its first representative to the state House in a century, and its first Democrat to the state Senate since 1930. Both houses picked up Democratic seats as Ned Lamont, a Democrat from Greenwich, was elected governor.